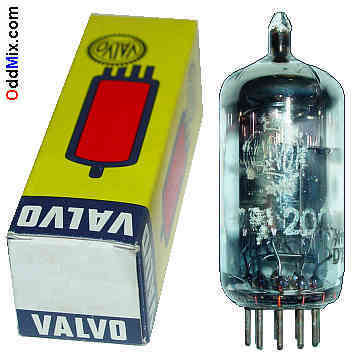 This is an original, Valvo PCF200 Triode, Pentode, decal electronic tube. The triode and pentode are completely separated within the glass envelope with the available one extra, added pin. The PCF200 decal tube is designed for RF [Radio Frequency] but useable in AF [Audio Frequency] circuits. Possible substitutes: 8X9 preferred, ECF200 - identical but the heater voltage. A pentode or a triode is useful for many other special purpose circuits like oscillators, RF amplifiers, multivibrators, blocking oscillator, replacement part, circuit research and experimentation or for antique radio, instrument, TV television restoration projects or to set up a private vacuum tube museum. It is NOS tube - New Old Stock, unused, without box, excellent condition.